It’s Friday and there are three weekend-worthy stories to share with my fellow search nerds. In other words: hey SEOs, entertainment ahead! 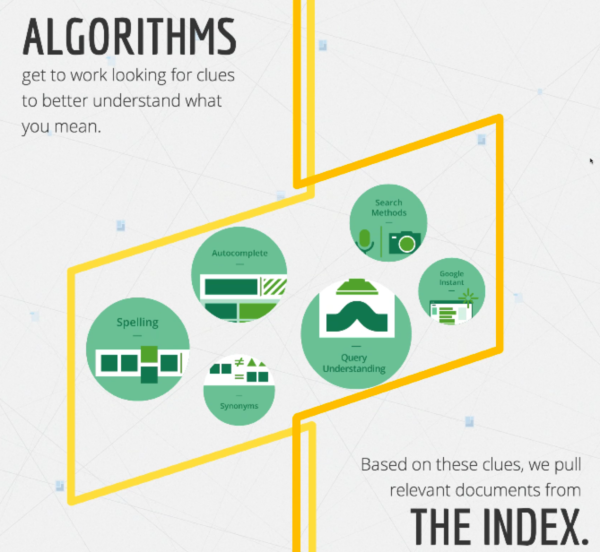 Google revealed a behind-the-screen look into How Search Works with an interactive infographic. It covers how the search engine crawls and indexes the Web as well as how its algorithms and ranking signals decide what to show in SERPs. Most notable for SEOs, however, is probably the portion on Google’s war on spam. For the first time we see near-real-time spam being removed from search results and graphs that indicate the spam team’s manual actions against site’s flagged for spam. Another first for Google, it published a version of its Search Quality Rating Guidelines. Released along with How Search Works, it’s an abridged version of the document that Google’s human search quality raters use to grade search results. The omissions are significant and include a section that guides quality raters on exactly how to rate pages and judge website reputation. Also missing is info about grading locally focused content. Still, this release and How Search Works are unexpected moves toward transparency by the search engine. And one more for fun. Getting in on the funky YouTube craze that blew up last month, YouTube went meta on the meme with an Easter egg that shakes the video site itself!